Surround yourself in sophisticated island whimsy at this beautiful home located just 1 lot from the Atlantic Ocean between Palmetto Blvd and Point Street. 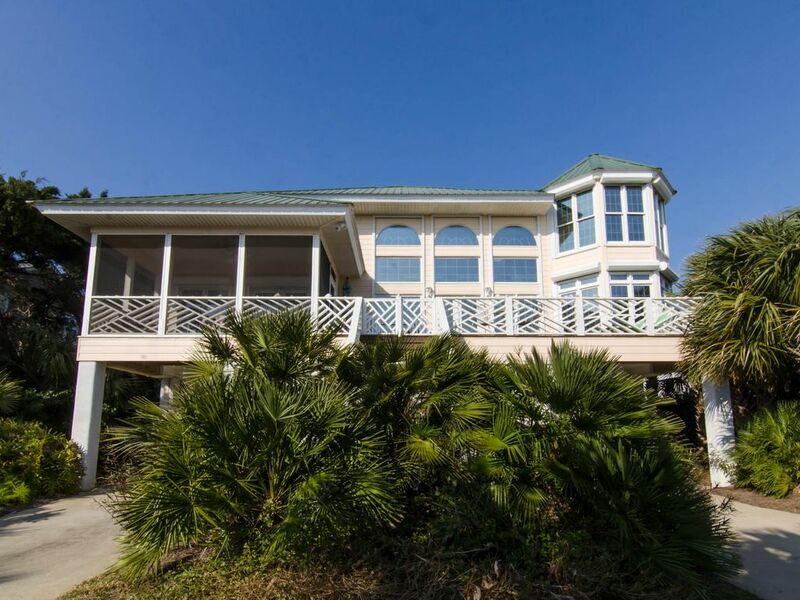 This spectacular home offers an expansive deck and spacious screened in porch that present countless opportunities to view dolphins, boaters, birds, and artistic sunsets. Soak in the sweet southern evenings while swinging on the front porch swings with the sound of ocean waves as your soundtrack. The ground level features a screened patio which is a great place to chill and grill with plenty of paved covered parking for the boat. A bright and poised interior is beaming with joyful sunlight and charisma providing a lovely reminder that you are at the beach and to savor the peace of your vacation. The 2nd floor octagonal ocean view crow's nest is the perfect place to enjoy a great book, an afternoon nap, or just take in the breathtaking views. No detail has been overlooked to ensure your comfort. Internet access and flat screen televisions with cable access in every room will keep each guest entertained if a brief afternoon shower interrupts your sunny day on the beach. Magnificent hardwood floors, 2 story great room, and exceptional furnishings will make you want to call "Casa Del Sol" your home away from home. The gorgeous open kitchen features granite counter tops and top of the line appliances fit for any Low country feast. Don’t miss the opportunity to relax and renew with an exquisite and unforgettable Edisto Beach vacation. No Smoking. No Pets. House was great.... location is great! Big, bright with ocean views and breeze... have already reserved for next year. This was my family's third consecutive Edisto vacation staying at Casa Del Sol. This is a very nicely furnished and up to date island home. There are no paved roads to cross to get to the beach with very little traffic. Our family has enjoyed every week that we have stayed in this house. We had a great vacation in Casa Del Sol with two other couples. The house is very nice inside and has all the comforts of home. The beach is less than 200 yards away from the driveway. We have already booked our vacation for mext year. Casa Del Sol was a great vacation getaway! It is a beautifully appointed and spacious property, it was clean and well equipped with everything we needed for the week! Especially loved the screened in, outdoor family eating area added an extra fun element of the beach to our stay. Thanks for a memorable stay on Edisto! I will definitely ask for Casa Del Sol when we come back.